The Chicago store is designed to be a gathering place for local communities and host year-round "Today at Apple" programming events. Apple's all-new Chicago Store boasts some impressive features. 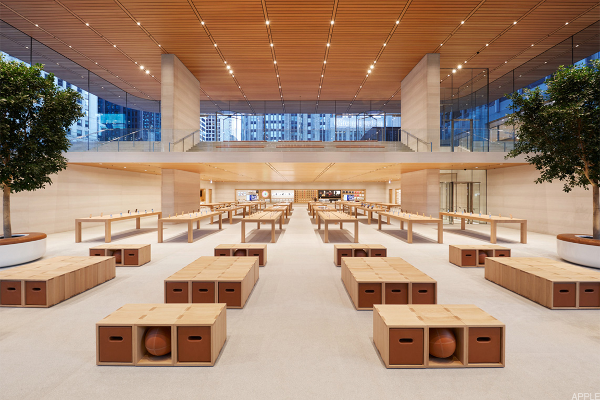 Apple (AAPL - Get Report) on Friday debuted the first look of its all-new downtown Chicago store located on the Windy City's famed Michigan Avenue. The store will open Friday, October 20 at 5 p.m. Central Time. The tech titan dubs the location the "newest and most ambitious store, creating a new connection between North Michigan Avenue, Pioneer Court, and the Chicago River." The Chicago store is designed to be a "gathering place" for local communities, and host year-round Today at Apple programming events. Today at Apple is a collection of educational sessions covering topics including photography, music, coding, and design. Each session is led by highly-trained Apple team members, but in select cities, the programs could be led by "world-class" artists, musicians, and photographers. "When Apple opened on North Michigan Avenue in 2003, it was our first flagship store, and now we are back in Chicago opening the first in a new generation of Apple's most significant worldwide retail locations," said Angela Ahrendts, Apple's senior VP of Retail. "Apple Michigan Avenue exemplifies our new vision where everyone is welcome to experience all of our incredible products, services and inspiring educational programs in the heart of their city. Apple is a holding in Jim Cramer's Action Alerts PLUS Charitable Trust Portfolio. Want to be alerted before Cramer buys or sells AAPL ? Learn more now. 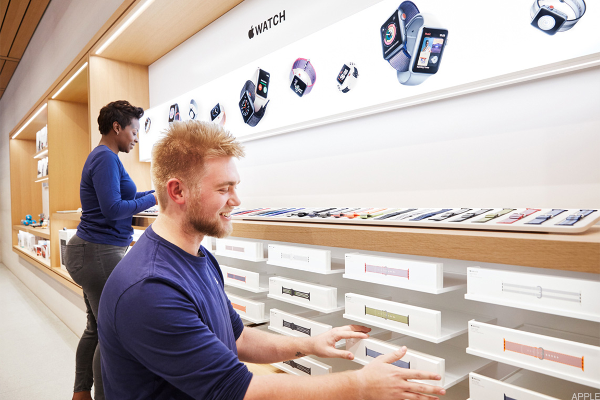 Is Apple the world's greatest retailer? The brand new retail location connects the Chicago River with Pioneer Court and Michigan Avenue, and "unites a historic city plaza that had been cut off from the water, giving Chicago a dynamic new arena that flows effortlessly down to the river," said Jony Ive, Apple's chief design officer. 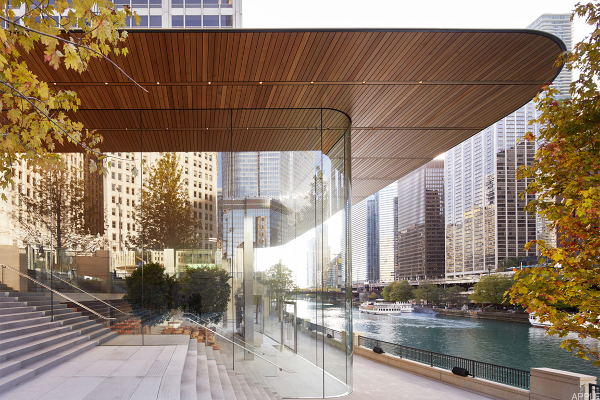 Apple's new Chicago store will also "enliven" the city's Riverwalk as every design feature strives to "minimize" the boundary between Chicago and its river. Across the Chicago region, Apple's nine stores employ 1,300 employees including new Creative Pros, the "liberal arts equivalent" of Apple's technical Geniuses, who oversee free daily Today at Apple sessions. 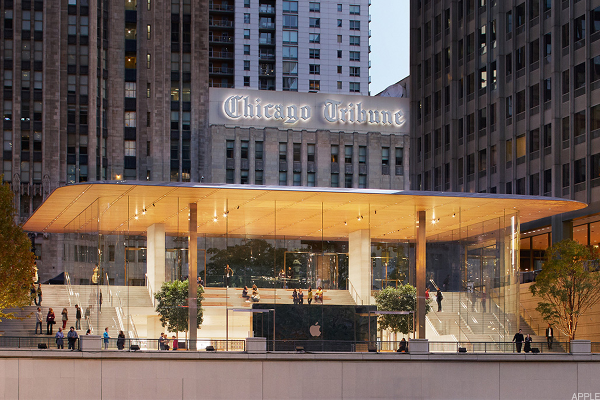 Beginning on Monday and spanning the next four weeks, the Apple store in Chicago will host a set of five programs, each including a different area of focus at the "intersection of technology and liberal arts." Each program centers on a theme or project intended to make a positive influence in the community. The building's 111-by-98 foot carbon-fiber roof was designed to be as thin as possible. The whole store is supported by four interior pillars that allow the 32-foot glass facades to remain unobscured. There is a large Apple logo on the store's curved metallic roof, which causes the building to bare a striking resemblance to a MacBook from an aerial view.